Safe Haven Campaign is a much-needed public awareness/ educational campaign. It is uniquely designed for communities of faith to become catalysts in their communities. The Safe Haven Campaign exposes human trafficking in local communities, raises awareness, and provides faith communities of with tools to combat the expansive growth of human trafficking in addition to protecting their own families and children. In the Media: Diamondback News Reports "Alpha Sigma Phi Helps Eight Greek Organizations Become Safe Haven Certified"
University of Maryland's Alpha Sigma Phi fraternity was the first Greek organization in the United States to become a certified Safe Haven, an organization trained in human trafficking awareness and response. 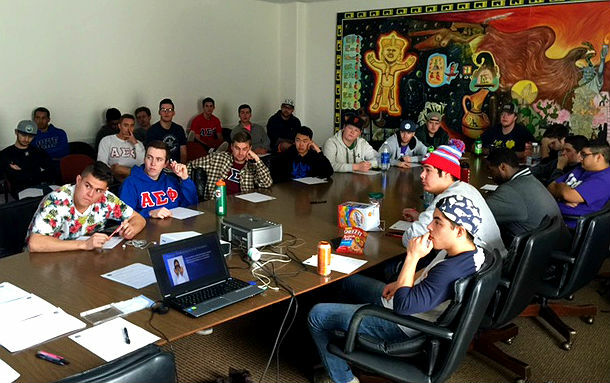 According to ChicoER News, Chico State University fraternity--Alpha Sigma Phi--became the first Greek organization on the West Coast to join anti-human trafficking efforts through becoming a Safe Haven on December 5, 2015. Public awareness is essential in abolishing this crime because of the hidden nature of the problem, and the shame of the victims. America is the top destination country for human trafficking in the world, in addition to having its own internal population of American-born victims. Interfaith action on the issue of human trafficking can bring powerful results. The purpose of the Safe Haven Campaign is to move faith communities to act as catalysts of a broad-based public awareness campaign which will significantly contribute to prevention and abolishment of human trafficking in our neighborhoods. Safe Haven’s primary education and awareness-raising tool is the “Safe Haven Small Group Study Series” used by faith communities, nonprofit leaders, organizations, and neighborhood associations. The study series, comprised of 4 sessions, comes with a DVD, and Small Group Workbook that helps inform, facilitate and stimulate discussion. It also contains various “homework” projects and other action steps that groups can take. What makes the “Safe Haven Small Group Study Series” immediately valuable to faith and community groups is that it’s self-driven and does not require an “expert” to teach or speak. Groups can take action independently to raise awareness and chose actions that fit their communities. Approach: Safe Haven provides direction for all levels of engagement in the efforts to protect families, and abolish trafficking in our communities. Public awareness brings an environment of accountability, which is the foundation of prevention. Through this national network of faith communities, public awareness will spread among concerned community members, an environment can be created to enable victims to have the courage to come forward. Become a Safe Haven today.